Sunset Bay and the associated beach is a great place to dive just south of Coos Bay on the southern Oregon coast. The bay provides good protection from rough Pacific Ocean conditions that are prevalent along the Oregon coast. The sandy beach is a good place to practice mellow surf entrances and associated skills. Parking and access can be a challenge on popular weekends when the beach is covered with families and the parking lot is completely full. Sunset Bay is a good place to practice surf exits and entries in a relatively mellow environment. In spite of the summer crowds, this site can be a lot of fun to dive. Along the outer rims of the bay, rocks provide ample cover for marine life. For those with a boat or who are okay with a lengthy surface swim, you can reach the outer reaches of the bay. To the north there are several good dive sites and to the south the area along the shore can be dived in good ocean conditions. A kayak dive platform is handy to explore the further reaches of this dive site. Charleston, Oregon is just up the road from Sunset Beach. Further up the highway is Coos Bay. Follow the Cape Arago Highway south from Charleston. You can’t miss Sunset Bay. In the summer, traffic backups will let you know far in advance of reaching the bay. There are large lots maintained by the State parks department. The last time we were here, we think we remember paying to park although the situation might be different now. Double check that you are in a designated parking spot and make sure you have paid to park if it is required. The parking lots are heavily patrolled on the weekends. The site is laid out in a convenient north-south-east-west configuration. The ocean is roughly west from the beach. The interesting rock formations and marine life are on the north and south sides of the bay. To return to the beach, head east. This is a surf entrance/exit across a beach. Be sure to have appropriate training for the conditions you may encounter here. We haven’t seen a washtub effect at this beach but that doesn’t mean that it doesn’t exist. At the popular Monastery Beach down in Monterey, California, people routinely die within 20 feet of shore because they don’t know what they’re doing. It is a good idea to decide which side of they bay you want to focus on. Park closest to that side and then enter from the beach in that general area. Pay attention to where the waves are breaking. The entrance/exit will be much easier if you can do so where there aren’t big waves breaking on the beach. Luckily it is rare for the entire beach to have breakers. It is rare for there to be much in the way of waves in general at this dive site but Sunset Bay can still produce them. This is a shore dive although for the outer reaches, you may want a boat or kayak dive platform. Usually conditions are pretty good here. You may encounter some waves and surf. Tidal exchange isn’t too strong usually. If you go outside of Sunset Bay, conditions get much rougher and many of the areas outside of the mouth of the bay are inaccessible to divers during rough sea states. The bottom is mostly sand and rocks. Depending on if the upwelling is occurring in the ocean and what the ocean is doing, you can have anywhere between 5 feet and 35 feet of viz here. Temperatures at depth are usually in the 45-55F range depending on time of year. On the surface near the beach, it can get up into the 60s in the summer. We like diving here in the fall, winter and spring. Sunset Bay during the summer is crammed with beachgoers which makes access difficult. We understand that at the mouth of the bay you can find up to 50 feet of water at high tide. We haven’t found it that deep but there’s a good chance that if you look around, you’ll find some deeper areas. Most of the site is in the 15-35 foot range. You should have good surf entry/exit skills. While Sunset Bay is usually mellow, conditions can rapidly change. You don’t want to become a statistic. We rate this as an intermediate dive because of the surf entry/exit. Depending on where you park, you could walk between 150 and 1000 feet. Park as close as you can to where you want to enter. Kick out from the beach at least 500 feet to get into deeper water. Sunset Bay gets deeper the farther west you go. Surf entrances/exits are no joke. 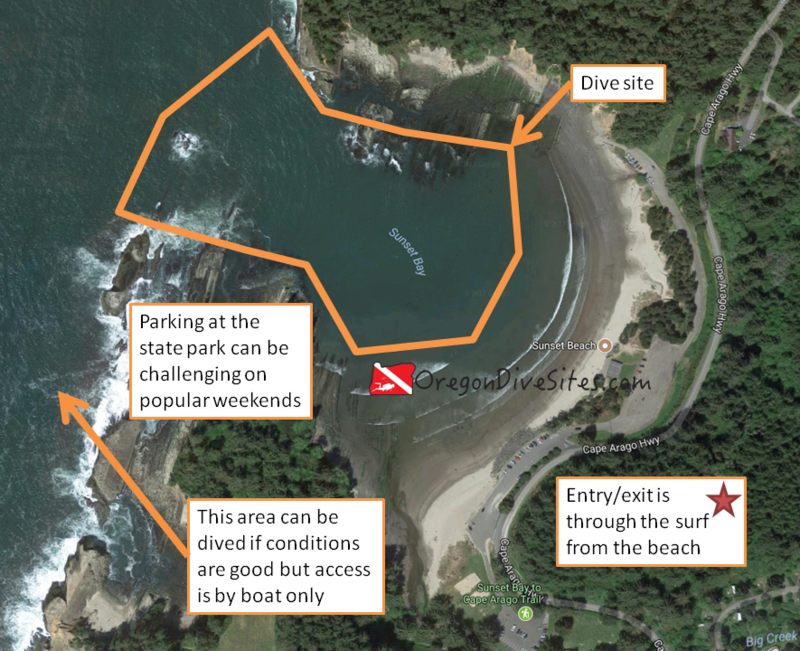 We know that many divers who were trained in the Willamette Valley didn’t receive hands-on surf entrance/exit training. It’s worthwhile having an instructor teach you how. A lot of people frequent Sunset Bay. It’s a good idea to have a dive flag (we have one we use and love) and pay attention to what you’re doing. Check our local dive shop page to find the most up to date information. As of the last time we edited this page, Port Orford and North Bend both have places you can get an air fill. North Bend’s shop should be full service. Otherwise you’re looking at heading inland to get gear serviced or a tank filled. There is a fun place to eat right on the dock in Charleston. There are many state and federal campgrounds in the general vicinity. Some even have yurts. We haven’t tried any of the hotels around the Coos Bay vicinity so please let us know if you have a favorite that is SCUBA diver friendly.